The 2019 KÜRZ FS 250 uses a new air cooled 250 4-stroke engine combined with light weight components for maximum power to weight ratio, offering more power than its predecessors. Giving you the experience of enduro and motocross that's affordable to all, granting you access to a sport once thought too expensive, ensuring the competition is shown what you're made of. The KÜRZ FS 250 has a few features that set it apart from normal event bikes, with just the push of a button you can kick that electric start into action, so no more kick-starting your bike if you stall in the middle of an event, saving you energy and time. Also featuring enduro lights so you can extend your track or adventure time even when the sun goes down. The all new T204 dual beam chromoly frame provides incredible strength and nimble agility with perfect weight distribution for all riding conditions. This big yet still light weight bike offers easy manoeuvrability around tough technical terrain, and then releases its power for a bust of straight line speed. With new up-to-date KURZ components and styling this machine is built with endurance and reliability at the forefront of its design being perfect for all levels of riders looking to rip up a track or dart through the wilderness. 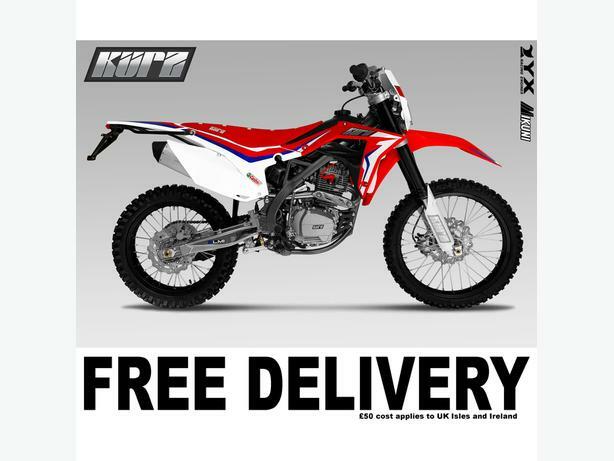 * The KÜRZ FS range are Road Legal off-road models, suitable for minor/limited road use only. Extended road use may invalidate warranty - this bike can be registered for road use please consult your dealer for more information.